The number of Americans being impacted by the misuse and abuse of opioids has reached epidemic levels. As opioid overdoses become more common, the greatest threat continues to be in rural communities that lack the capacity to deal with the issue on their own. NOSORH has developed a compendium of all Rural Opioid Educational Resources available across our website to aid individuals looking for education, tools, and other resources. This includes reports, webinar presentations, meeting presentations, and a compendium of resources and lessons learned from grantees of the Federal Office of Rural Health Policy’s Rural Opioid Overdose Reversal (ROOR) grant program. As new resources become available, more information will be added. For more information on NOSORH’s rural opioid resources and education, contact Chris Salyers at chris.salyers@nosorh.org. Click here for a list of all opioid resources on the NOSORH website. Illinois is tackling the opioid crisis in its rural communities through a series of opioid summits sponsored by the Illinois Center for Rural Health (ICRH). The first “Opioid Crisis Next Door” summit was held June 2016 with the stated purpose of building local coalitions to increase awareness of opioid and heroin use in rural communities and to identify ways for communities to respond to the crisis. At the end of the summit, attendees took a pledge to work together to combat opioid misuse in rural Illinois, Casper said. Local coalitions, healthcare providers, and other rural community stakeholders attended the “Opioid Crisis Next Door: Identifying, Organizing and Activating Local Resources” summit in October 2017. Each subsequent summit has added a specific focus. The opioid summit held in March of last year focused on “,” with the goal of encouraging dialog among providers. The October 2017 summit looked at “.” The next summit, scheduled for June 27 of this year, will be focused on “Keeping the Momentum: Are We Hitting the Mark?” and will include naloxone training for overdose treatment. “All the summits have a rural focus, but it’s been different aspects of rural,” Casper explained. The summits have had an average of 100 attendees and all have been held in the state capital of Springfield, centrally located and within a few hours’ drive for everyone in the state, Casper said. Summits are held twice a year now, she said, because they realized they cannot wait a full year for the next one, there is so much to go over. Rural stakeholders from across Illinois participate in a 2017 “Opioid Crisis Next Door” summit. The target audience for the summits includes rural hospitals, rural providers, pharmacists, law enforcement, policymakers, community leaders, and behavioral healthcare providers. In addition to ICRH, the summits receive support from the Illinois Health and Hospital Association, the Illinois Pharmacists Association, the Healthy Communities Partnership, and the Illinois Critical Access Hospital Network (ICAHN). The summits have offered a variety of speakers, including physicians on treatment options, community leaders and hospital administrators on creating community coalitions, and past opioid users sharing their stories of addiction and recovery. The opioid summits are funded using a small amount of Rural Hospital Flexibility Grant money, Casper said, with the rest of the cost, mostly for food and the rental of the space, paid by the attendees. Although opioid misuse may not be as prevalent in Illinois as it is in other states, the number of opioid-related overdoses is growing every year, according to Heidi Clark, IDPH Division Chief of Health Data and Policy. While there were , there were an estimated 2,093 overdoses in 2017, Clark said, a number she attributes to the increasing use of dangerous synthetic opioids like fentanyl and its analogues. “Opioid abuse is a statewide problem but there are specific issues in different parts of the state and among different demographics,” Clark continued. “In some of the more rural areas, there’s more prescription drug misuse, whereas in urban areas you’ll see more emerging drugs such as new fentanyl analogues. But rates of neonatal abstinence syndrome (NAS) are growing in rural areas in Illinois much faster than urban areas.” NAS is when a baby is born physically dependent on drugs and experiences withdrawal symptoms after it’s born. Does your SORH have a “Promising Practice”? We’re interested in the innovative, effective and valuable work that SORHs are doing. Contact to set up a short email or phone interview in which you can tell your story! Are you or your partners planning to write for any of the future rural opioid projects? Join the webinar Rural Opioid Resources: Preparing Your Organization for Future Funding Opportunities on May 7th at 3:00pm ET. The webinar will provide SORH and their rural health partners with a collection of resources which may be helpful in seeking funding for federal rural opioid funding opportunities. The goal of the webinar is to provide a framework to begin planning for a grant application. Participants of the webinar will be introduced to some of the existing resources for selecting an appropriate intervention or strategy for their grant program. Data sources will be discussed which can assist applicants in refining their intervention or supporting the need for their grant application. The webinar will close with a discussion on how to work with partners to develop a consortium of members that are primed to react when grant opportunities are released. This webinar will NOT focus on any specific funding opportunity that has been announced, but rather provide a potential framework for future applicants to gather the appropriate materials in preparation for writing for one of the funding opportunities. As guidances are released, NOSORH will conduct future webinars focusing on the specifics of individual funding opportunities. NOSORH encourages all partners to share this information with potential applicants and other stakeholders. To register for this webinar, click here. A recording will be made available on the NOSORH website within 24 hours following the webinar. 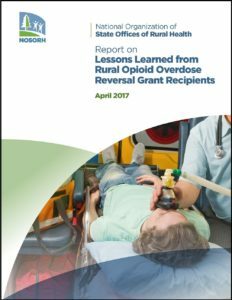 NOSORH is proud to announce the release of a report on the lessons learned from the Rural Opioid Overdose Reversal grants. The Federal Office of Rural Health Policy awarded grants to 18 organizations to combat the impact of opioid overdose at the community level. Awardees in the pilot project were funded to increase the availability and utilization of naloxone and to focus on the importance of referring individuals dependent on opioids to an appropriate substance abuse treatment center. Awardees freely shared lessons learned and educational resources developed. “This is a great compilation of the excellent work that can be conducted to build collaboration in rural communities,” said Teryl Eisinger, NOSORH Executive Director. The report is available here on the NOSORH website. Stay tuned for more information on a webinar that will be held later this month to learn more about the resources and the report. Through lay rescuer training and the distribution of lifesaving kits, Virginia is taking aim at opioid overdoses in the state. Now it is increasing its outreach into rural parts of the state through the Virginia State Office of Rural Health (VA SORH). Between 1999 and 2013, the number of deaths from opioid overdoses in Virginia . “When we looked at the data we found that the opioid epidemic was hitting our bigger cities and our rural areas—especially in Appalachia (the southwestern part of the state) and the Shenandoah Valley,” said Michael Mallon, Assistant SORH Director at the VA SORH. In the Shenandoah Valley, the opioid epidemic is defined primarily by heroin and other illicit drugs, while in the Appalachia region, it’s prescription opioids, Mallon said. The state’s project trains professionals and others (including family members of addicts) to recognize and respond to an opioid overdose with the administration of naloxone, a drug that can save lives if given in the first few minutes after an overdose. The lay rescuers who take the training also receive a kit that contains gloves and directions—but, until recently, no naloxone. Mallon said that it has been difficult to provide naloxone both because its cost has in recent years (the cost of the injectable version has risen 600 percent), and because of existing state policy—prior to last November, obtaining it required a prescription from a physician. Since then, Mallon said, the Virginia Commissioner of Health has issued a statewide standing order declaring opioid overdoses a public health emergency, making it possible for anyone to go to a pharmacy to get it, with counseling on its use, from the pharmacist. “But the cost issue hasn’t gone away,” Mallon said. So, he said, the VA SORH requested authorization to use its state funds for one year to buy naloxone for those who take its REVIVE! training. “We’re hoping we can use this as a catalyst to find someone else to fund it in the future,” he said. Even with this temporary funding, there is still some difficulty in providing the drug from a logistic standpoint, Mallon said. “A lot of states are allowed to find funding, buy naloxone, and distribute it,” he said. “In Virginia, nonprofits cannot access it directly, but still must get it from a pharmacy, and only the pharmacies can distribute it.” Fortunately, Mallon said, REVIVE! has found a mail-order pharmacy that offers discounts to government agencies for the nasal spray version of naloxone, and it can ship the drug directly to those who have received the trainings. After July 1st, the VA SORH and its partners will be able to dispense naloxone directly to the lay rescuers at the trainings themselves because the Virginia General Assembly has passed a law allowing coalitions and nonprofits to dispense it. “This will provide another access point,” Mallon said. The VA SORH is planning to offer 10 REVIVE! trainings in rural areas this year. Each session will train up to 25 lay rescuers, Mallon said.